I love this Simple CrockPot Italian Chicken that’s served over zucchini noodles, and this tasty slow cooker summer dinner is gluten-free and low-carb as well! Click here to see the Top 20 Slow Cooker Chicken Dinners! Click here to see The Top 20 Instant Pot Chicken Dinners! 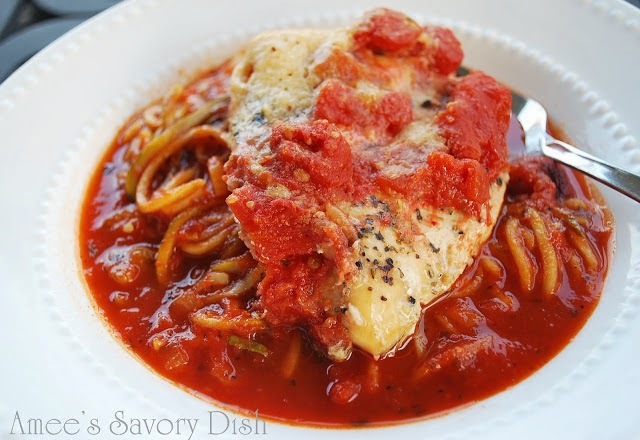 For Friday Favorites we feature past recipes you may have missed, and I think this delicious-sounding Simple CrockPot Italian Chicken served over zucchini noodles sounds like a great summer meal! There’s a lot to love about this Simple CrockPot Italian Chicken, starting with the way Amee uses a rack inside the slow cooker so the chicken doesn’t turn into a soggy mess while it cooks. I also love the generous amount of grated Parmesan that I’m sure makes this chicken taste amazing, and how it’s served over zucchini noodles so the dish is gluten-free and low-carb. I’d probably keep the zucchini noodles raw for a little crunch; I think this sounds perfect for a Summer Dinner the whole family will enjoy! Use the Index Page for Chicken to see all the slow cooker or pressure cooker chicken recipes that have been featured on this site. Thanks for including some of my favorite turkey breast recipes from The Perfect Pantry. The stuffed turkey breasts are always a wow, and I often make one alongside a whole turkey, to be sure we have plenty of everyone’s favorite.